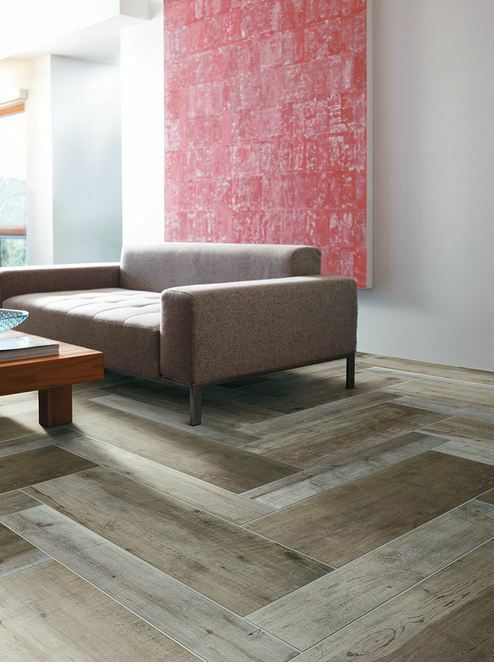 Wood Look Porcelain Tile Planks | They’ve been around for years but have recently exploded in popularity. In years past, tile planks resembled laminate that resembled wood, i.e. a copy of a copy. In a word, they looked really, really fake (they couldn’t even qualify as ‘faux’) and they were expensive. Not a typical marketing angle (sure it looks fake, but it’s overpriced as well). In the same way technology allowed smart phones to outsmart flip phones, modern manufacturing methods create porcelain woods that are far more authentic than their predecessors. 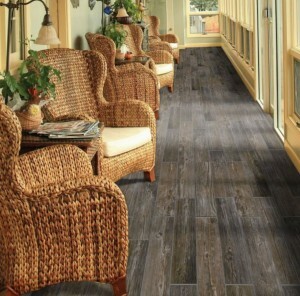 The new technology allowed manufacturers to make porcelain woods with no compromise in appearance. 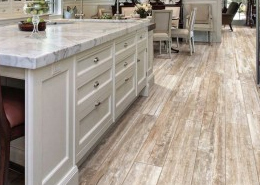 Once installed, many porcelain woods can fool even the most experienced wood flooring installers. Inexpensive, mid range and high end. Pets. Dogs can’t scratch it. Pet accidents are easily cleaned. Tile can’t be stained or discolored. No Waxes, Sealers or Finishing. Glazed tile requires only sweeping and mopping… period. Permanent Finish. Throw away your brushes & sandpaper. Glazed tile looks the same for a lifetime. No refinishing-ever! Termite Proof. Porcelain tile is a lot of things, but it’s not tasty to termites. It’s not Kindling. Porcelain tile is fire proof (up to about 2,000°), AND tile doesn’t feed a fire. Water/Flood Damage. What happens to tile when a pipe bursts? Usually nothing at all. Hydrostatic Pressure (ground water through your slab to your flooring). No problem for porcelain. Natural Beauty. Many tiles have a high recycled content. Trees are only used for pallets. Price. 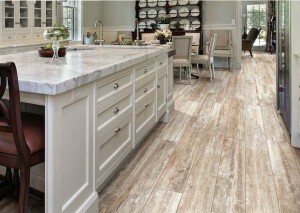 You’ll find porcelain tile planks in all price ranges and they are comparable to wood floors. Porcelain Woods. Beautiful in form, and virtually indestructible in function. A wide variety of colors, lengths and formats available. A price that is cost competitive to real wood. At Villagio we love tile materials and designing with all colors and textures of tile. We specialize in unique tile materials from the best manufacturers. Come for a visit and explore our showroom – we guarantee you’ll be inspired! Why Tile Triumphs To Infinity and Beyond!